What I like best about this book are the many suggestions for meditations, ideas for connecting, and ways of shifting attention and energy as we walk and explore the nature surrounding us. The writing is vivid (letting us see a particular place from the comfort of home), and the ideas and practices are very accessible. While the focus of the book is the mountains surrounding San Francisco Bay, the author's suggestions could be applied anywhere and everywhere. In this time of increasing disconnection from the natural world, this book offers inspired pathways for connecting and deepening our relationship to place. These pathways integrate experiences, stories, myths, natural history, and experiments we can try alone or in groups. Circling San Francisco Bay is far richer than hiking trail guides, more spiritual and inspirational than most travel guides, and broader in scope than almost any book offering practices to try out. Inspired by vision and honed with the experiences and feedback of many groups exploring the mountains with Ms. Anderson, it's a book you can enjoy and work with for many years. 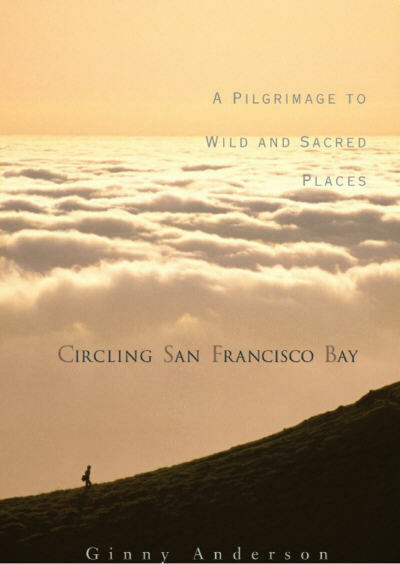 Circling San Francisco Bay: A Pilgrimage to Wild and Sacred Places is a wonderful book, full of love and appreciation for this planet that we share. Author Ginny Anderson has filled this book like a picnic basket, full to overflowing with all sorts of invitations to readers to join her in forging a closer and truly reciprocal relationship with the natural world. The invitations come in the form of suggested exercises and meditations, journal-entry style reflections from those who have journeyed with the author into the wild and sacred places mentioned in the book title, and evocative descriptions of exploratory adventures in these special spots around the Bay Area. The result is that the book offers a very accessible bridge for those of a more pragmatic mindset who may be interested in exploring the spiritual side of life, but aren't quite sure how to do it. Because the path Ms. Anderson illuminates is one that focuses on being fully present in the community in which we each live, it is a path that by definition each of us can follow. This is a very readable book, and one from which I know I will continue to extract precious insights during many repeat reads in the future. Ginny Anderson's Circling San Francisco Bay gives a whole new meaning to the concept of "guidebook." Though the author acts as practical and capable guide through every chapter, she is wise enough to let Nature do the guiding on her own terms. Anderson demonstrates through prototypical journeys and destinations how Nature is in turn wise enough to let the reader guide herself through any territory being explored. Readers may ask, "If Nature will guide us, why do we need this book?" Without arguing the question of need, Circling San Francisco Bay offers itself as a resource embodying two of the essential skills and qualities of a guide: experience and connection. The author draws on a lifetime of experience ministering to both individuals and communities, as well as extensive experience interacting with the "personalities" of the Bay Area sites she includes as examples. She draws on this experience to establish sure and nourishing connections with the reader and to motivate and deepen the reader's ability to connect with Nature. What makes this book work is its easy mobility among the realms of the psyche or soul, the immediate natural environment, and the world at large. The book discusses important stops along the way in each of these territories and identifies interconnections among them, as well as bringing the focus "full circle" through meditations and exercises so that the reader is continually empowered at the most basic level: individual action. While Circling San Francisco Bay teaches us to guide ourselves, it promotes and preserves a sense of interdependence. Without arguing the question of need, it makes a compelling case for choosing connection, with ourselves, with each other, and with our surroundings. The message of this wonderfully written book is "We live in paradise." Nature's gifts are all around us for our infinite pleasure and to teach us -- to remind us of our place in the miraculous unfolding of the universe. It is in the wild and sacred places surrounding us that we can learn the most according to this gifted teacher of many earth traditions. The focus of the book is the San Francisco Bay Area where the author currently lives, but these insights apply to where ever one might live. Our own paradise only awaits our recognition which can be given to us by learning from the Nature around us. We only need to listen -- listen to our inner stirrings as they respond to a myriad of Nature's voices. While this book is a celebration of a particular piece of planet called, San Francisco Bay (a magnificent piece at that), the exercises provided would open the doors of communication anywhere. Indeed, to me, this is a major value of the book. It is a virtual goldmine of consciousness elevating, "enlightenment" exercises, practices, ritual and ceremony. You are asked to identify your breath with the rhythmic pulse of the Earth, to invite the fragrance of wide coastal sage to clear your mind of thoughts and to become fully present in the moment, to communicate with the ancient cypress trees, to learn to shed what you have outgrown and want to let go from the eucalyptus, to seek peace (personal and planetary) in the stars. You are taught to recognize many of Nature's portals and given the means to learn from, honor and celebrate the web of life that sustains us. Anderson weaves a wonderfully rich tapestry of transformation and regeneration through the loom of a number of earth traditions (i.e. Andean Shamanism, Geomancy, Celtic Druid, Native American, Norse, and Indian Traditions) exposing connections between the elements of nature and the pilgrim's own consciousness. This book speaks, in more ways than I can list here, to the value of ritual in our everyday lives. It is a delightful excursion into the bigger meaning of small things, the illuminating insights of dark times and the utter joy of fully experiencing the moment. I was profoundly reminded of the importance of ritual to a meaningful life in the high Andes of Peru. I was with my brothers, the Q'ero who, through daily ritual, honor their connections to nature with daily greetings to the sun, offerings to Mother Earth, the mountains, sky and stars. As Pachamama's children, they playfully and lovingly acknowledge their intimate connection with the natural world. All of my book learning was mere verification of what these very wise 'illiterate" brothers and sisters already knew. It was then that I realized that I needed to re-enchant my life with the meaning that this mystical child-like playfulness brings. This present volume is the best guidebook to this re-discovery that I have ever seen. It will always occupy I very special place on my reference shelf. While extolling the universal applicability of this amazing little book, I do not want to neglect its primary intention which is to celebrate the sacred places circling San Francisco Bay. I, too have lived many years in this area and while I have loved it, nothing has given me the appreciation for this paradise more than this compendium of shamanistic insight with Western scholarship. Did I mention that this "enlightenment workbook" is complete with references and citations? -- a legacy to the author's previous Stanford University affiliation, no doubt. To the author, the magic of the San Francisco Bay Area is sustained by the mountainous terrain that surrounds it. It is the powers of the land and sea that provide "the chalice and the mead for our changing consciousness." Mount Tamalpais, Ring Mountain, Mount Diablo, Mount Hamilton, Mount Umunhum and San Bruno Mountain together create a tangible circle around the communities of the Bay Area, "holding us, lovingly cupped in the hands of Mother Nature," she praises. And, as she continues, "they shape our weather, create a geographical enclosure with permeable boundaries, and hold secrets about life-sustaining processes that continue to function whether or not we pay attention." This magnificent volume is a plea for us all to pay attention and through the exercises and ceremonies mentioned above (and many others) to relearn what we have forgotten about being part of our earthly paradise. I can't do better than conclude with the author's own concluding paragraph: "We live in Paradise. As we walk its sacred space, we open ourselves to deeper relationships with all the beings who share it. In the audible silence of nature, we risk exposing our deepest fears, hopes, and feelings to the trees, to the wind. to the waters. In the canyons and on the peaks, we hear what we must do in order to live harmoniously with other beings of the natural world. We discover new capabilities and approaches from the natural world itself. Here in the mountains, we surrender to the pleasure of being fully alive in the moment and know that what we receive creates the power to sustain that which gives us life. The sacred space within these mountains becomes a powerful container of inspiration and vision for the future." In short, "Circling San Francisco Bay" is a wonderful reminder of Nature's gifts and the need for the solemnity, playfulness and joy of spirit in our lives to recognize them. The Q'ero would love it.